BSF officer Jitendra Singh, who was posted as assistant commandant with the border security force, was killed during a ceasefire violation by Pakistan in Samba district of Jammu and Kashmir on June 13. When Samundar Singh hugged his son Jitendra Singh before he left to Jammu railway station, little did he know that six hours later, his son would become a martyr. 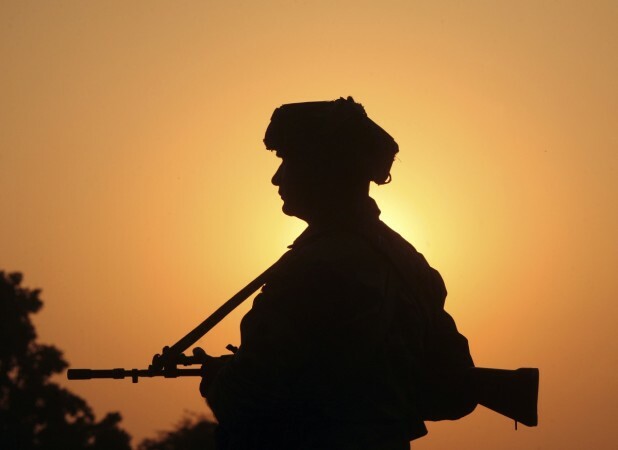 The 34-year-old Border Security Force officer who was posted as assistant commandant was killed during a ceasefire violation by Pakistan in Samba district of Jammu and Kashmir on June 13, Wednesday, reports The Times of India. "Barely six hours ago, he had hugged me at Jammu railway station. I got the news of his death when I was still travelling," Choudhary was quoted as saying by TOI. The news of Jitendra's death was told to him by a BSF official while he was travelling from Jammu to Jaipur. Ever since the news of his son's death started making rounds on WhatsApp groups and local news channels, Samundar's house in Jaipur witnessed many families and friends paying their condolences. "My son had called me a few days ago and insisted that I visit him in Jammu before he is promoted to the rank of deputy commandant and transferred," the grieving father told TOI. "Now is the time to take strict and resolute action against Pakistan." The jawan, who hails from Bharatpur district, is survived by his wife Renu and three-year-old son Yash. Before joining the Border Security Force in 2011, Jitendra was a meritorious student who had won several awards for debates and competitions. Jitendra's last rites were performed in his native town of Bharatpur. In yet another unfortunate incident, BSF constable Hans Raj Gujjar from Alwar, was also killed in the same cross-border firing. The 28-year-old jawan had told his wife that he would meet his newborn son after returning to his native place. However, he never made it back.